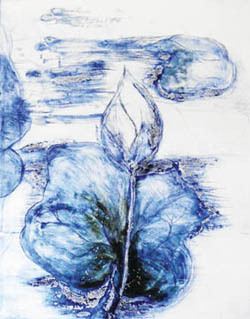 Transcending Cultural Differences A Theme In Sasi Victoire's Artwork. Investigating Cultural Differences - Sasi Victoire. Cultural differences and male dominance within some cultures are subjects which visual artist, Sasi Victoire, has investigated through visual imagery. Sasi was born in Malaysia, but has lived and worked in Australia for much of her life, training there as an artist and teacher. In 1998 she moved to Cairns from Victoria and became involved in teaching, writing, curating exhibitions, coordinating festivals – and furthering her own artwork, which mostly explores ideas through the mediums of printmaking and sculptural installations. 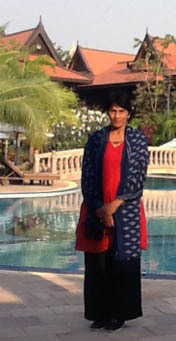 An avid traveller, Sasi is also interested in organising touring exhibitions, both nationally and internationally. 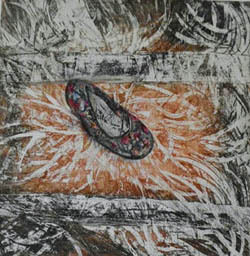 She recently completed a three month residency in Thailand, where she developed a body of work based on printmaking techniques. The results of her explorations were then exhibited at the Tanks Arts Centre in Cairns, North Queensland. Sasi is a contributor to various international and national art journals and has written and illustrated two children’s books. “I believe that the value of art as a tool is often overlooked and undervalued in society. Art relies upon and needs a partnership with an audience to complete its process. In my work I need to impart a message that has relevance to the theme. In my previous work I have questioned male privilege in my family and the double standards in culture that were glaringly obvious. The women’s roles were even more puzzling; as gate-keepers, women procured compliance by restricting movement and censorship that further inflicted control and misery upon women.